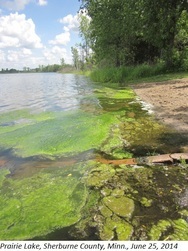 Note to editors: Photographs of the algal bloom on Prairie Lake are available at http://www.pca.state.mn.us/xggx3b9. The photographs were taken on June 24, 2014 and may be reprinted, with credit given to the Minnesota Pollution Control Agency. Video B-roll is also available on request (a sample is posted on YouTube). St. Paul, Minn. – A dog died last weekend after swimming in a Sherburne County lake that had developed areas of heavy algae growth, according to the Minnesota Pollution Control Agency. Last weekend, Brock Tatge and his family, who live on Prairie Lake in Sherburne County, were enjoying a beautiful Sunday on the lake when their dog, Copper, suddenly became very ill. Copper had been fetching his tennis ball from the lake, one of his favorite games. “We noticed that Copper went on shore, began vomiting and panting very hard, and just looked very sick,” Tatge said. “I carried him to my truck and brought him to the vet’s office.” Sadly, Copper’s condition deteriorated and he died at the veterinarian’s office. While the cause of Copper’s illness has not been confirmed, the veterinarian who examined him believed that he became ill after ingesting toxins from blue-green algae. The MPCA is advising pet owners to check water conditions when dogs are playing near lakes or slow-flowing streams. Blue-green algae “blooms” have a thick, cloudy appearance that can look like green paint, pea soup, or floating mats of scum. Some, but not all, species of blue-green algae contain potent toxins that can be deadly to dogs, livestock, and other animals within hours of contact. In this case, though most of the visible algae on Prairie Lake was not blue-green algae, MPCA staff found some blue-green algae mixed in with the more benign species. If possible, dog owners should keep their pets away from algae-laden water entirely. If animals do enter water with heavy algae growth, they should be hosed off right away, before they have a chance to lick themselves clean. Animals become ill when they ingest the toxins, so preventing them from drinking affected water or licking toxins from their coat is key to preventing illness. If someone is concerned that their pet has been exposed to harmful blue-green algae, they should take the animal to a veterinarian immediately. Blue-green algae blooms can occur anytime during the summer, though they are normally associated with warm weather and low rainfall. Algae are a natural part of the ecosystem, but under certain conditions, algae populations can “bloom” with dramatic growth. Most blue-green algae are not toxic, but there is no way to visually identify whether a particular bloom contains toxins that are harmful to people or animals. The best way to prevent algal blooms over the long term is to reduce the amount of nutrients that run off into lakes from fertilizers and organic materials like leaves and yard waste. Once a bloom has developed, there is no way to correct it. Blooms often come and go quickly, so the best option is to stay away from the water until rainfall, wind shifts, or cooler temperatures disrupt the algae’s growth. If humans are exposed to toxic blue-green algae, they can experience skin irritation, nausea, and eye, nose, and throat irritation. People should never swim in water if they suspect a blue-green algae bloom. Human deaths from exposure to blue-green algae are extremely rare, since the unpleasant odor and appearance of a blue-green algal bloom tend to keep people out of the water. More information on harmful blue-green algae can be found at http://www.pca.state.mn.us/zihy141d. The Minnesota Pollution Control Agency is advising dog owners to keep their pets away from algae-laden water following the death of a dog in Sherburne County over the weekend. Certain species of blue-green algae contain potent toxins that can be deadly to animals within hours. If pet owners see an area where water is thick, cloudy, or bright bluish-green, they should keep pets and children away. If a pet does enter algae-laden water, rinse it off with fresh water, and don’t allow the animal to lick its fur until it is clean. Anyone who is concerned about a pet’s possible exposure to blue-green algae should consult a veterinarian immediately.